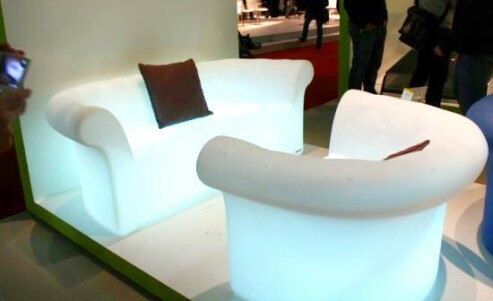 Ambiance glowing furniture dubbed Sirchester Luminous Sofa is now available in the UK’s furniture market. A great option for renewing your living room’s interior. Sirchester Luminous Sofa is providng the same comfort and style you would find on a classic English Chester sofa, the only difference is the ambiance glowing light on the sofa. Sirchester luminous sofa comes with a padded quilted backrest and an inner drainage system keeps the seat dry in case of a shower. Available in yacht blue, white, black, hide, apple green and fuchsia, the Sirchester sofa is one groovy decor solution to both lighting and seating.